Known for stirring up trouble and making moonshine, Gertie and Ida Belle are anything but boring old maids. Their Southern charms and reputations have earned these icy-blue haired ladies considerable notice. After a bestselling book series rocks the entertainment world, Hollywood comes to call in search of the women who inspired such a great work of literary fiction. Ida Belle and Gertie set out on a journey to find the traitor who is selling their stories and making a mint. Celia Arceneaux, a likely suspect, is a frontrunner but the culprit is a little closer to home. And CIA Agent-in-Hiding Fortune Redding will have no other choice but to trust Gertie and Ida Belle as they race against time to protect Fortune’s cover and keep her out of the limelight and a gunman’s sights. 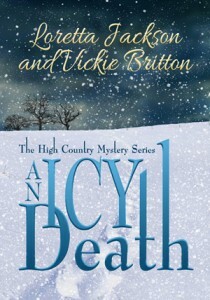 In the heart of a raging blizzard Sheriff Jeff McQuede discovers a woman frozen to death in her car. 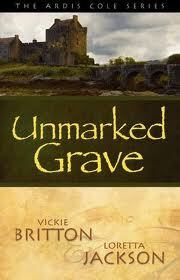 At first he believes her death to be an unfortunate accident–until he finds clues that point to cold-blooded murder. Margaret’s husband, Arthur, left her in the stalled vehicle to brave the storm and manages to reach Joe Trevino’s isolated ranch. The case becomes more complicated because of the recent warehouse robberies at Trevino’s store. McQueede finds that Trevino is Margaret Burnell’s business partner, and that she has traveled from their Casper store to conduct a company audit. In addition, Margaret has planned to meet with her only child, a run-away daughter she hasn’t seen in years. Trevino, the missing daughter, and Arthur Burnell would all profit financially from Margaret’s demise. Has a relentless killer tracked and sabotaged the Burnells, or did Arthur simply abandon his wife for his share of the money, leaving her to die an icy death? It’s cold in Wyoming! Cold enough to freeze to death. This fact makes An Icy Death the only book we have ever written inspired by the weather. In winter it’s not uncommon for the temperature to dip to minus seventeen, often with a wind chill factor of thirty below zero. Because many places still exist where cell phones cease to work and help is almost impossible to summon, blizzards and sudden whiteouts are extremely hazardous. We got to thinking of what might happen if a murderer used a blizzard to cover up a crime and AN ICY DEATH was born. A Reader’s Favorite 2013 Finalist in Adventure. While traveling on a local bus in Chinchero, Peru, Arla is approached by a mysterious female peddler who shows her a small, silver warrior. The statue is identical to those found only in rare Inca tombs located high in the Andes. Arla suspects this is a genuine artifact, perhaps stolen from the same Capacocha burial site her co-worker, Lance Hayden, is seeking. When the woman tells her she has many more items for sale, Arla follows her to an abandoned house. Too late, Arla realizes she has fallen into a trap! Arla gets kidnapped by a group of ruthless thieves who are holding Lance Hayden hostage. They believe Arla’s in possession of a journal, which is the final link to the Lost City and the secret it holds. 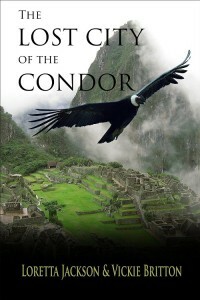 A race against time takes Arla to a snowy mountain peak and a clash with the looters for the most priceless treasure of all – the golden condor! An exciting trip to Peru and a trek up to Machu Picchu inspired us to write about the Inca. The story developed from the setting and the fascinating history of this area. Ardis Cole travels to Scotland to do a facial reconstruction on a skull her friend Bruce McBrier has discovered in the woods outside his ancestral castle. Because of an ancient ax buried in the skull, Bruce presumes the skull to be a historical relic, possibly the remains of a medieval ancestor murdered in battle. When Ardis makes the shocking discovery that the remains are that of a more recent murder, Constable Mark Ridley asks her help in going ahead with the facial reconstruction in hopes the victim can be identified. But someone is willing to go to great lengths … even murder … to keep the skull’s deadly secret. My sister and I took a trip to Scotland and we saw many interesting castles and heard intriguing stories about Scottish history. We just had to write a book set in Scotland, so we chose this setting for our second Ardis Cole mystery. What a deal! This short story book introduces Sheriff Jeff McQuede, the hero of the High County Mystery Series. 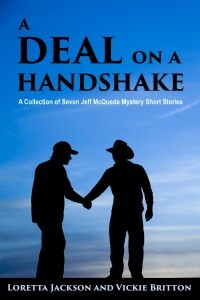 In these seven mysteries Sheriff Jeff McQuede finds himself square in the middle of a deal made on a handshake—where the result is murder. Set in modern-day Wyoming, the stories take place at an old-time mountain man rendezvous, in a pawn shop where traders vie over rare Native American pottery, and after an engagement ceremony where two family patriarchs pretend to bridge a lifetime of feuding by the gift of a rare peace pipe. McQuede’s arch-enemy Ruger, is a suspect in many of these tales, and just manages to evade his traps. In each of these stories McQuede= relentlessly seeks out the dangerous men who have broken trust. Full-length novels in the High Country Mystery Series include Murder in Black and White, Whispers of the Stones, Stealer of Horses, and The Executioner’s Hood. The inspiration to write this book and all the books in the High Country Mystery Series arose from the Wyoming setting and the many stories we’ve heard, both past and present. Our background in antique dealing also led to the creation of many stories that deal with rare finds and artifacts discovered in unusual place such as swap meets. The High Country of Wyoming seemed a perfect place to tell our tales. Quiet Kismet, Pennsylvania, may look like any other small town, but as a home stager, Caprice De Luca can see behind closed doors–and it seems someone has designs on murder. . .Life is a full house for Caprice these days. She’s dating, she’s rescuing adorable cocker spaniels, and she’s decorating the roomy interiors of Kismet’s most well-heeled residents with fun fantasy themes. But she’s worried about her pregnant sister. Bella’s marriage is coming apart like a bad wallpaper job, and to make matters worse, she’s decided to meet up with a former flame Bob Preston, a house painter Caprice frequently employs. When he’s found dead in a pool of green paint swirling with blood, it’s time for Caprice to stage an investigation. With all eyes trained on Bella’s husband, Caprice shifts her attention from finding the perfect curtains to finding the perfect culprit. . .
Catch up with Caprice’s adventures in STAGED TO DEATH, Book 1 of the Caprice De Luca home staging mystery series. Since this is book 2 in the Caprice De Luca Home-staging series, I wanted to continue Caprice’s interest in solving crimes, staging houses and taking in stray animals. I also wanted to resolve Caprice’s sister’s family problems. The famous Carlo painting Stealer of Horses sells for cash in a small Wyoming town and gallery owner Sheldon Spence gives the $200,000 to his wife, who walks over to the bank to make the deposit…and never returns. A witness claims to have seen a frightened-looking Susan Spence in a battered old Chevy, speeding out of town. And each succeeding clue reveals a different angle on her disappearance. Sheriff Jeff McQuede begins to wonder if this is more than a simple case of kidnapping and robbery. Was Sheldon involved in Susan’s disappearance? Or did Susan and a lover fake the scheme, planning to run off with the money they stole from Sheldon? The identity of a victim found shot behind the wheel of the Chevy holds the key to one ominous question: Is Susan Spence a kidnap victim—or is she part of some sinister ploy? We actually heard a similar story about a woman who went to make a large bank deposit and didn’t return for a long period of time. There were concerns at the time that she might have been kidnapped and abducted. While there was a logical reason for her temporary disappearance, this event inspired our story. Caprice DeLuca stages houses for high-end clients. When she discovers a body in the castle-mansion she staged to sell and starts asking questions, she finds herself in danger. On the way to solving the murder, Caprice’s large Italian family helps and hinders. She also finds romance with Dr. Seth Randolph. But does her brother’s partner, attorney Grant Weatherford, care about her, too? Or is he just worried she’ll get herself killed and her family will blame him? Enjoy solving the mystery with Caprice, cook along with her, see her find homes for the stray animals she protects, be a part of the De Luca family…in STAGED TO DEATH. 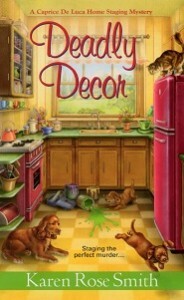 Watch for Book 2, DEADLY DECOR, in June 2014. Watch for Book 3, GILT BY ASSOCIATION, in February 2015. I have a rich Italian heritage and grew up surrounded by aunts, uncles and cousins. All of the women in my family were terrific cooks and I learned from them. So my sleuth, Caprice, and I share many personality traits. Most of all, we share a love of animals. Sheriff Jeff McQuede finds ‘Bartering Bill’ Garr murdered at his rural antique store. Only one item is missing — a rare artifact believed to be the Pedro Mummy. First discovered in a cave in Wyoming, the Pedro Mummy was reported missing in the 1950s. Dr. Seth Talbot, newly arrived in town, has put out a fifteen-thousand-dollar reward for any information on the mummy, hoping that modern technology will prove his theory that a tiny race of people actually existed: one the Shoshones call the Nimerigar, or Little People. McQuede is astounded to find the mummy in the trunk of Seth Talbot’s car. Talbot swears he;s being set up by rival co-workers — Dr. Arden Reed, in particular — who plans to benefit from his research. McQuede suspects the theft of the mummy is a red herring used to cover up the true motive for the crime. The closer he comes to the truth, the deeper McQuede is drawn into an elaborate hoax that threatens his career and places him in grave danger. When I was living in Laramie, Wyoming, I heard tales of the Pedro Mummy which caught my interest. In the 1930s a tiny mummy was discovered by miners in the Pedro Mountains The mummified remains of a tiny man only 14 inches tall was found sitting cross-legged on a stone ledge in a cave. At the time of the mummy’s discovery, it was thought to be the remains of a tiny, ancient little man in his late sixties. Many people believed that the tiny mummy might be proof that the “Little People” of Native American legends actually existed. This curious artifact passed from hand to hand until it finally disappeared from history without anyone really knowing who he was or how he got there. Our book was inspired by a fabulous trip to Egypt. We were fortunate to have seen the pyramids and the highlight of our trip was a look at the golden mask of King Tutankhamen. While there, we learned about Queen Hatshepsut, the only woman pharaoh to rule Egypt. Her architect and lover Senmut had sworn to guild two stone obelisks with sold gold in her honor. However, before he could carry out his plans, they were attacked by Tutmose 111. What happened to the gold became the inspiration for our fictional tale.